Moana, Disney’s Pacific Island princess, took audiences in south Auckland movie theatres by storm. And now, Animation College is bringing that opportunity to more enthusiasts with its Manukau campus. Samoan comic book artist and wrestler Michel Mulipola came out in support of this programme to encourage creative youths. 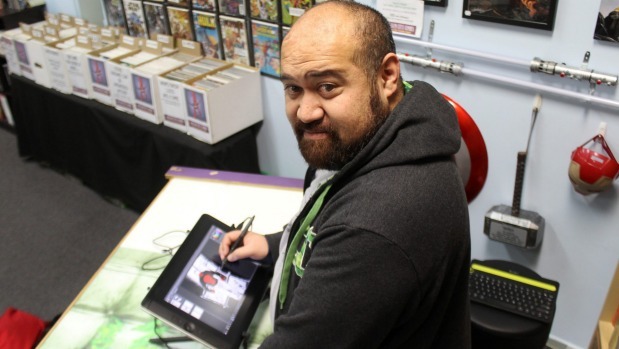 Born and raised in Mangere, he runs a website called Bloody Samoan, shines light on the positives of Pacific Islanders, and shares his passion for comics. “It [bloody Samoan] is one of those terms I heard a lot as a kid. And I thought it would be really funny if I took that negative term and turned it into a positive one,” he says. Growing up he didn’t have the opportunity to learn the art of “drawing for comic books”. While he had the steady support of his mum, he says it wasn’t a popular career choice. He also helped a friend establish the Arkham City Comics store in Royal Oak Shopping Mall and often works on his upcoming projects from there. The self-taught cartoonist says youth are now seeing a future in the arts. According to a 2013 PricewaterhouseCoopers report, Global entertainment and media outlook: 2013 – 2017, the animation industry is worth US$222.8 billion with an additional US$500b in animated related income. “Animation College has created this great creative atmosphere for students to pursue their dreams,” Mulipola says. Students will learn technical and production knowledge, legal requirements, animation history, dialogue, scene planning etc. Animation College sales and marketing director, Gene Harris says even though Moana was written by Taika Waititi, it still had a distinctly American flavour. “We should be telling our own cultural stories. There is so much creative talent right here in South Auckland, but there are limitations with technology,” he says. The two-year Diploma in Applied Animation – 2D programme is priced at $9299 per annum. It will be run at Animation College, Westfield, Manukau from April 24. It is NZQA accredited with Studylink loans available. Applicants must be a minimum of 16 years of age and hold an NCEA level 1 or equivalent.